Lesson time: 30 Minutes Basic lesson time includes activity only. Introductory and Wrap-Up suggestions can be used to delve deeper when time allows. We don’t always know ahead of time what things will be like when we run our computer programs. Different users have different needs, and sometimes you will want to do something based off of one user's need that you don’t want to do with someone else. That is where conditionals come in. This lesson demonstrates how conditionals can be used to tailor a program to specific information. This is a great time to review the last lesson that you went through with your class. You can do this as one large group or have students discuss with an elbow partner. What do you wish we had had a chance to do? Did you think of any questions after the lesson that you want to ask? What was your favorite part of the last lesson? Finishing the review by asking about the students' favorite things helps to leave a positive impression of the previous exercise, increasing excitement for the activity that you are about to introduce. If the students succeed, point out right away that they succeeded, so they do get the reward. Otherwise, point out that they were not completely quiet for a full thirty seconds, so they do not get the reward. Ask the class "What was the condition of the reward?" If you were, the condition would be true, and you would get the reward. If you weren't, the condition would be false, so the reward woud not apply. Can we come up with another conditional? If you can guess my age correctly, the class can give you applause. If I know an answer, I can raise my hand. Sometimes, we want to have an extra condition, in case the "IF" statement is not true. Example: IF I draw a 7, everybody claps. Or ELSE, everyone says "Awwwwwwe." Ask the class to analyze what just happened. Believe it or not, we have even one more option. What if I wanted you to clap if I draw a 7, or else if I draw something less than seven you say "YAY," or else you say "Awwwwwwwe"? This is why we have the terms If, Else If, and Else. Else-if gets looked at only if the "If" isn't true. Else gets looked at only if nothing before it is true. 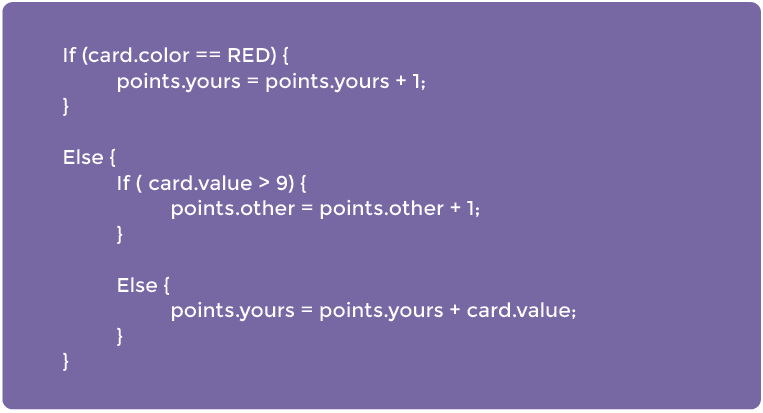 1) Create a few programs with your class that depend on things like a card's suit, color, or value to award or subtract points. You can write the program as an algorithm, pseudocode, or actual code. 2) Decide how you want to split your class into teams. 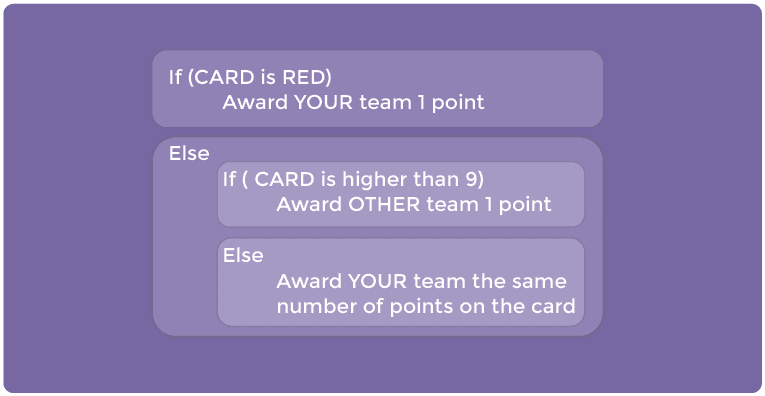 3) Each team should have a pile of cards (at least as many cards as team members) nearby. 4) Put one of your “Programs” up on the board for all to see. 5) Have the teams take turns drawing cards and following the program to see how many points they score in each round. 6) Play several times with several different programs to help the students really understand conditionals. 5) Flash Chat: What did we learn? If you were going to code this up in Blocky, what would you need to add around your conditionals to let the code run more than one time? What other things do you do during the day under certain conditions? If you are supposed to do something when the value of a card is more than 5, and you draw a 5, do you meet that condition? Notice that conditions are either "True" or "False." There is no assessment of a condition that evaluates to "Banana." 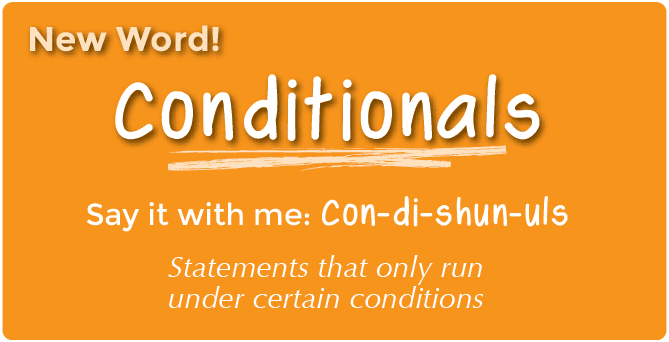 When you need to meet several combinations of conditions, we can use something called "nested conditionals." Can you give an example of where we saw that during the game? What part of that game did you like the best? Which one of these definitions did we learn a word for today? "Adding additional space to the beginning of a line of text"
"A combination of yellow and green"
"Statements that only run under certain conditions"
...and what is the word that we learned? Line students up as if to play Red Light / Green Light. Select one person to stand in front as the Caller. The Caller chooses a condition and asks everyone who meets that condition to take a step forward. If you have a red belt, step forward. If you are wearing sandals, take a step forward. Try switching it up by saying things like "If you are not blonde, step forward." Break students up into pairs or small groups. Have students create similar strips for outcomes. Once that's done, have students choose three of each type of strip and three playing cards, paying attention to the order selected. Using three pieces of paper, have students write three different programs using only the sets of strips that they selected, in any order. Encourage students to put some if statements inside other if statements. Now, students should run through all three programs using the cards that they drew, in the same order for each program. Did any two programs return the same answer? Did any return something different? 1.a - Apply existing knowledge to generate new ideas, products, or processes. 1.c - Use models and simulation to explore complex systems and issues. 2.d - Contribute to project teams to solve problems. 4.b - Plan and manage activities to develop a solution or complete a project. 6.a - Understand and use technology systems. CT.L1:3-03. Understand how to arrange information into useful order without using a computer. CT.L1:6-01. Understand and use the basic steps in algorithmic problem-solving. CT.L1:6-02. Develop a simple understanding of an algorithm using computer-free exercise. CT.L1:6-05. Make a list of sub-problems to consider while addressing a larger problem. CPP.L1.3-04. Construct a set of statements to be acted out to accomplish a simple task. CPP.L1:6-05. Construct a program as a set of step-by-step instructions to be acted out. CT.L2-03. Define an algorithm as a sequence of instructions that can be processed by a computer. CT.L2-06. Describe and analyze a sequence of instructions being followed. CT.L3A-03. Explain how sequence, selection, iteration, and recursion are building blocks of algorithms. 1.MD.4. - Organize, represent, and interpret data with up to three categories; ask and answer questions about the total number of data points, how many in each category, and how many more or less are in one category than in another. SL.1.2 - Ask and answer questions about key details in a text read aloud or information presented orally or through other media. L.1.6 - Use words and phrases acquired through conversations, reading and being read to, and responding to texts, including using frequently occurring conjunctions to signal simple relationships. SL.2.1 - Participate in collaborative conversations with diverse partners about grade 2 topics and texts with peers and adults in small and larger groups. SL.2.2 - Recount or describe key ideas or details from a text read aloud or information presented orally or through other media. L.2.6 - Use words and phrases acquired through conversations, reading and being read to, and responding to texts, including using adjectives and adverbs to describe. SL.3.1 - Engage effectively in a range of collaborative discussions (one-on-one, in groups, and teacher-led) with diverse partners on grade 3 topics and texts, building on others' ideas and expressing their own clearly. SL.3.3 - Ask and answer questions about information from a speaker, offering appropriate elaboration and detail. L.3.6 - Acquire and use accurately grade-appropriate conversational, general academic, and domain-specific words and phrases, including those that signal spatial and temporal relationships.